The conclave which followed the death of Pope Paul IV lasted nearly four months as the cardinals were confronted with opposing lobbying from the Spanish and French courts and the manoeuvres of Cardinal Carlo Carafa, nephew of the deceased pope, who favoured a candidate who would grant him retention of the power which he had acquired because of the protection of his uncle. Eventually on Christmas 1559 the cardinals elected Cardinal Giovan Angelo de' Medici, who was supported by Cosimo de' Medici, Duke of Florence: the two were not relatives, but the pope (who chose to be called Pius IV) adopted the coat of arms of the Florentine family. One of his first acts was to proceed against the Carafa: at the end of a short trial Cardinal Carafa was strangled and his brother, Duke of Paliano, was beheaded. The new pope, who during the pontificate of his predecessor preferred not to live in Rome, followed the advice of Cardinal Morone and revised the procedures used by the Roman Inquisition to ascertain heretical behaviour; these procedures had led to a veritable witch-hunt. He also restored good relations with Philip II, King of Spain and his uncle Emperor Ferdinand I. 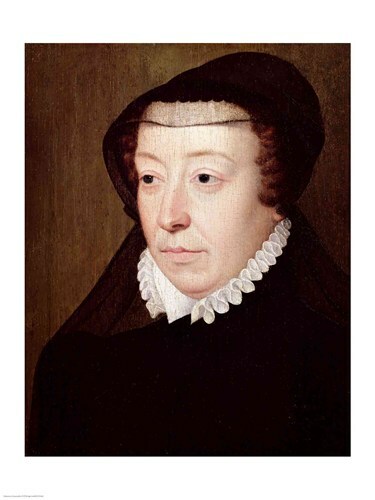 In France the power was in the hands of the queen mother Catherine de' Medici, who initially followed a policy of tolerance towards the Protestants of France. Pope Pius IV completed the plan started by Pope Paul III to strengthen the fortifications of Rome and in particular of the Vatican. He turned Castel Sant'Angelo into a modern fortress by adding to it four bastions and a star-shaped wall. He also completed the new walls which protected the Vatican and which enlarged the area of Borgo by including Borgo Pio. 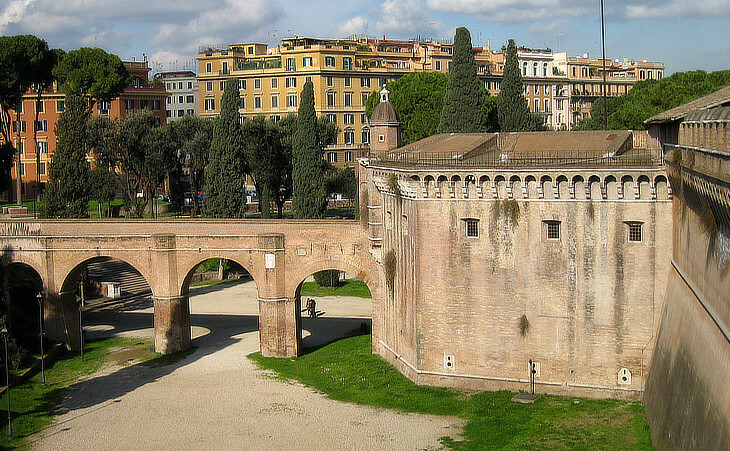 He opened Porta Angelica, a gate in the new walls (Angelo was one of his names) and Porta del Popolo and Porta Pia in the old walls. He took care of rebuilding and strengthening the walls of Anagni, a town which had been sacked by the Duke of Alba in 1556. In 1562 Pope Pius IV opened for the third time the Council of Trent: its original aim to heal the rift among the Christians was abandoned in favour of a clearer definition of the doctrines of the (Roman) Church. Even though the prelates attending the Council had no longer to deal with the many theological issues disputed by the Protestants, they were unable to reach agreement on some other important issues, such as the obligation for the bishops to actually reside in their assigned dioceses: such an obligation would have deprived the pope of the right to summon bishops to Rome to hold positions in the Curia: the acceptance of such an obligation would have weakened the papal role. The diplomatic skills of Cardinal Morone, sent by the pope as his legate in July 1563, managed to find a compromise on this and other open points. In December 1563 during a final session all the decisions taken by the Council were formally approved and in January 1564 the pope endorsed them. The Council abolished some of the most notorious abuses and introduced or recommended disciplinary reforms affecting the sale of indulgences, the morals of convents, the education of the clergy. Pilgrimages, the veneration of saints and relics, and the veneration of the Virgin Mary were strongly reaffirmed. The authorized interpretation of the decrees was reserved to the Pope alone. Pope Pius IV like many other of his predecessors assigned important positions to his relatives: two families in particular benefited from the papal decisions: the Borromeo, a Milanese family to whom belonged Cardinal Carlo, nephew of the pope; he was a man of great religious zeal who played a major role in implementing the Council decisions and in the overall Counter-Reformation process. 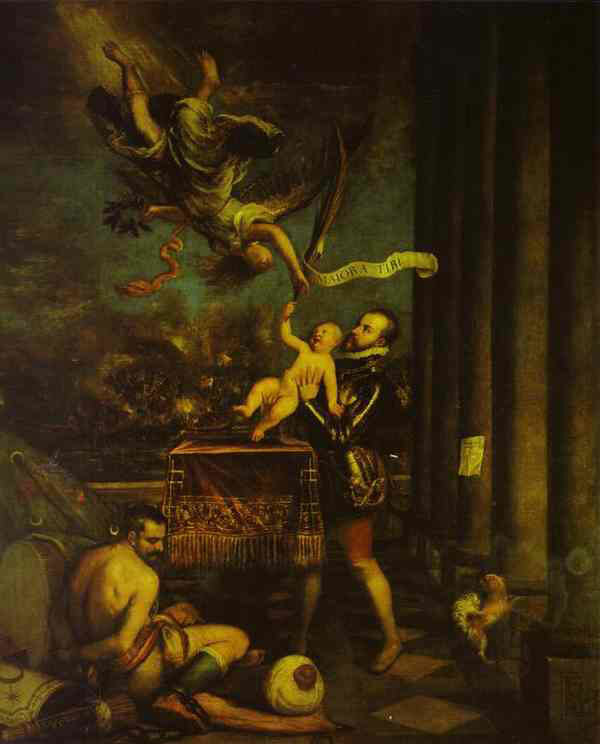 The Borromeo are still a prominent Italian family. The second family favoured by the pope was that of Cardinal Mark Sittich Von Honehems, another nephew of the pope who Italianized his name in Marco Sittico Altemps. Pope Pius IV completed a small casino in the Vatican Gardens which had been initiated by his predecessor: here the pope used to spend summer evenings with his close friends. The decisions of the Council had an impact also in the way the church dealt with the remaining Ancient Roman buildings: a precise policy was developed later on by Pope Sixtus V, but already Pope Pius IV asked Michelangelo to turn a large hall of Diocletian's Baths into the church of S. Maria degli Angeli; the impact of the Council led the pope to commission to Daniele da Volterra the covering of Michelangelo's Last Judgement nudities. Pius IV started the process of expansion of Renaissance Rome on the hills where once the Ancient City stood: Via Pia crossed the whole Quirinale Hill from the site where later on Palazzo del Quirinale was built to Porta Pia. By giving back to Cardinal Ippolito d'Este his position as governor of Tivoli, Pope Pius IV gave him the financial means to build his villa. The conclave which followed the death of Pope Pius IV in December 1565 was very short and at the suggestion of Cardinal Borromeo, the participants elected Cardinal Michele Ghislieri, a Dominican who led a very austere lifestyle. The Romans were impressed by this old man who led the processions barefoot and without the traditional pomp. He imposed severe sanctions against blasphemy and adultery: he ordered the courtesans to leave Rome, but at the request of many ambassadors and noblemen he allowed a few of them to remain in the city as long as their behaviour did not cause scandal. Unlike many other popes he did not favour his relatives, with the only exception of his nephew Michele Bonelli who was appointed Cardinal (and who later on built Palazzo Bonelli). His very rigid views led him to disregard the prudence and subtleness required by the complex religious and political European situation. He asked the Catholic sovereigns to eradicate the Protestants from their kingdoms. Cosimo de' Medici was asked to hand over to the pope Pietro Carnesecchi, a humanist who had served as secretary of Pope Clement VII and who had been allowed to add de' Medici to his surname as he was regarded as a member of the family. After a trial based on his private correspondence on October 1, 1567 Carnesecchi was beheaded in Castel Sant'Angelo and then his body was burnt. 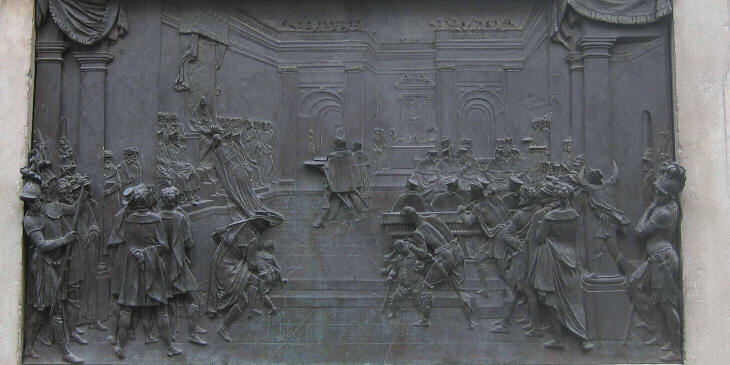 Three years later Aonio Paleario, another Italian humanist, was hanged and burnt in the same spot (he is remembered in the Monument to Giordano Bruno). The pope asked Catherine de' Medici to similarly act in France and supported the Catholic party in their fight against the Protestants. At Montcontour in 1569 the Huguenots (the French Calvinists) were defeated, but Catherine did not follow the papal advice and chose to sign a peace and to allow the Huguenots to hold office in France: she also agreed to give her daughter Marguerite to Henri of Navarre, a Protestant leader. The rigidity of the pope definitely compromised the return of England to Catholicism: he excommunicated Queen Elizabeth I, disregarding the advice of King Philip II who saw the disadvantages of an open conflict with England at a time when he had to quell a Protestant revolt in the Low Countries. Pope Pius V relied on the help of God and thought that the pope should not have cannon and soldiers, so he did not care about strengthening the defence of Rome apart from completing Tor S. Michele, a tower at Ostia. He built a countryside residence along Via Aurelia (Casale di Pio V) and he completed the ceiling of S. Giovanni in Laterano. He also built a new palace (Palazzo del Sant'Offizio) for the Inquisition. During the pontificate of Pope Pius V, Cardinal Alessandro Farnese started the construction of il Gesù, one of the largest churches of Rome and Cardinal Sittico Altemps turned an earlier building into Palazzo Altemps. In May 1570 a large Ottoman army landed on Cyprus which was then a Venetian possession; in a few months the invaders seized Nicosia and Kyrenia: they then laid siege to Famagusta, the main town of the island, but the Venetian gallantly resisted. The Venetian Senate appealed for help to the other Christian nations and Pope Pius V promoted a Holy League: France and the Emperor Maximilian II did not respond to the papal request as the former had signed in 1569 a Capitulations agreement which granted French ships free access to Ottoman ports and the latter had accepted in 1570 to pay an annual sum to the sultan as the price of peace in the Hungarian territories under his control. King Philip II of Spain, the Republic of Genoa, the Duchy of Savoy and the Grand Duke of Tuscany agreed to form an alliance with Venice to save Cyprus. A Christian fleet gathered at Messina in the summer of 1571: although Venice was the main contributor to the allied fleet, King Philip required its command be given to his half-brother Don Juan of Austria who arrived in Messina only on August 23. Dum Romae consulitur, Saguntum expugnatur (While in Rome - the Senate - debates, Saguntum falls - to the Carthaginians), this quotation from Titus Livius could as well be applied to Famagusta, because on August 5, the Venetians surrendered having exhausted their gunpowder supply. The Allied Fleet eventually left Messina and moved eastwards: in the meantime the Ottomans relocated their fleet in the Gulf of Patrasso and based it at Lepanto: on October 7 the Allied fleet entered the gulf and was engaged by the Ottoman fleet. According to the tradition on that same evening Pope Pius V ordered the festive bells of Rome to be rung to celebrate the victory of the Christian fleet: the battle actually ended with the defeat of the Ottomans and even their Great Admiral was killed in the fight. Although Lepanto did not lead to the recovery of Cyprus (Venice was eventually left alone and in 1573 signed a peace treaty accepting the loss of the island), the battle was regarded as a turning point in the fight against the Ottomans and more generally as a victory over the enemies of the Church. 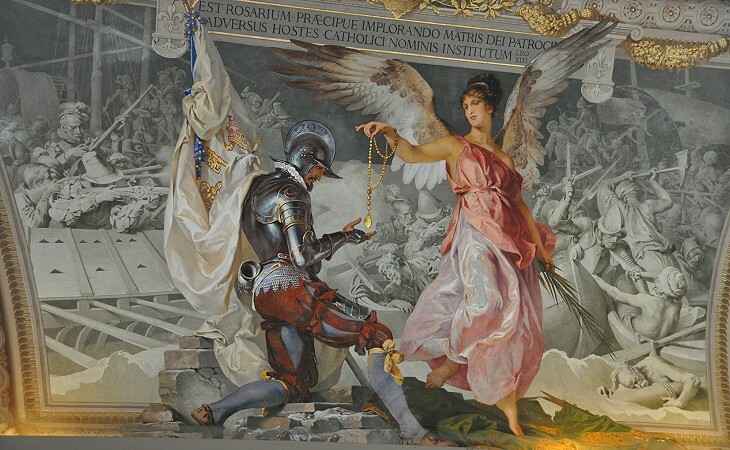 Pope Pius V decreed that October 7 should be celebrated as the festivity of St. Mary of the Victory; his successor Pope Gregory XIII chose to dedicate the day to St. Mary of the Rosary (the practice of the rosary was greatly recommended by Pope Pius V). The Papal State itself took part in the battle of Lepanto with a small fleet of hired ships under the command of Marcantonio II Colonna who bore most of the expedition cost. The return of the commander was celebrated in S. Maria in Aracoeli in what was a sort of Christian re-enactement of a Roman Triumph (you may wish to see a modern re-enactement at Marino during a yearly fair). Pope Pius V commissioned a new ceiling for the church which would celebrate the Christian victory (you can see a detail of it also in the image used as background for this page). 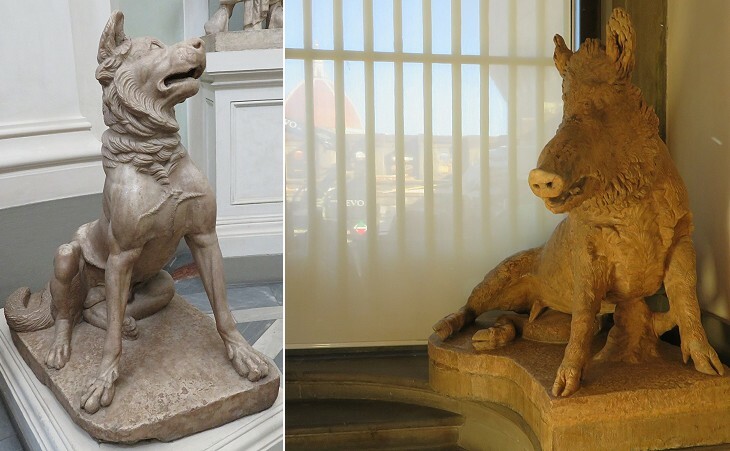 Marcantonio Colonna became the hero of the Colonna family and his role in the battle was celebrated by paintings and statues both in Palazzo Colonna and in Giardino Colonnese. Pope Pius V both for his ascetic lifestyle and his role in promoting the Holy League was regarded as a true defender of the faith and in 1588 Pope Sixtus V started his canonization process which however was completed only in 1712. In the 1950s Pope Pius XII who saw Communism as a major threat to the Christian Faith, promoted the construction of a church dedicated to the pope who defeated the Ottoman one: he chose a location close to S. Maria del buon Riposo where Pope Pius V used to rest and pray. The modern mosaic celebrating the pope shows two key aspects of his pontificate (the Battle of Lepanto and the promotion of the rosary devotion): it is interesting to note that when Pope John Paul II visited the church in 1979 he chose not to make reference to Lepanto (read the homily in an external link). Both Cardinal Farnese and Cardinal d'Este had great hopes of being elected pope at the conclave which followed the death of Pope Pius V in 1572 but they both had to face the hostility of King Philip II who favoured the election of Cardinal Ugo Boncompagni who had been nuncio (ambassador) in Madrid. The elected pope chose to be called Gregory XIII in homage to Pope Gregory the Great. He had become a priest late in his life (he had a legitimate son). He possessed a deep legal knowledge and he had the diplomatic skills his predecessor lacked. The new pope was soon confronted with tragic events in France; on the night of August 23 the Huguenot leaders who had assembled in Paris for the wedding of Henri of Navarre with Marguerite, sister of the king, were killed at the (likely) instigation of the queen mother (St. Bartholomew's Day): massacres of the Huguenots followed throughout France. The pope had no direct responsibilities for these events but he endorsed them by celebrating a Te Deum in S. Luigi dei Francesi. Pope Gregory XIII put a great deal of effort into restoring as much as possible the Catholic faith in Germany and in Central Europe; he was helped by Emperor Rudolf II, who reversed the tolerant policy of his father Maximilian II: the new emperor started an alliance between the Habsburgs and the Church which lasted two centuries (see some pages on Vienna and the last Roman Emperors). Pope Gregory XIII maintained Poland Catholic with the help of the Jesuits and established a link with the Christian communities of Rutenia (Eastern Poland/Western Ukraine) through the so called Uniate (united) Church. His policy towards England and Ireland (where he financially supported a rebellion) failed and increased the divide between Protestants and Catholics in the two countries. The action of Pope Gregory XIII in promoting the development of Rome was somewhat overshadowed by that of his successor Pope Sixtus V who is generally regarded as the designer of modern Rome. Pope Gregory XIII prepared the ground for his successor by issuing for the 1575 Jubilee Constitutiones de Aedificis, a decree which defined the legal framework for managing the urban development of the city. He gave new impulse to the construction of S. Pietro by completing its first section (Cappella Gregoriana). His predecessors had restored Acqua Vergine, an ancient Roman aqueduct, Pope Gregory XIII commissioned a series of conduits (after which Via dei Condotti) and fountains which provided again Rome with that ample supply of water which the city had enjoyed during the Roman Empire. 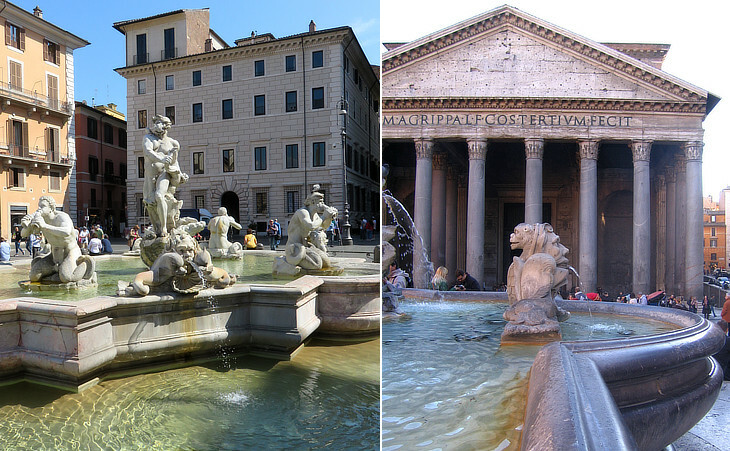 Almost all the fountains were designed by Giacomo Della Porta and some were modified later on by Gian Lorenzo Bernini. For the Jubilee the pope rebuilt an old Roman bridge (known as Ponte Rotto - broken bridge - because it was partially ruined during the 1598 flood) and he opened a new gate (Porta S. Giovanni). He also started the construction of Palazzo del Quirinale, initially meant to be a villa and which eventually became the usual residence of the popes. Pope Gregory XIII supported his foreign policy by establishing in Rome national seminars, so he founded Collegio Germanico, Collegio Greco (near S. Atanasio) and Collegio Inglese (near S. Tommaso di Canterbury). He defined in a better way the role of the nuncios and he opened new embassies in Switzerland and in Northern Germany. In internal matters he chose not to modify the rigid laws issued by his predecessor but he was very lenient in their implementation: this approach soon led to an overall disregard of the law which resulted in an increase of crime and in a general lack of security. The pope was also supportive of the Church taking the lead in scientific matters: he is remembered for the reformation of the calendar which was named after him (see a page on The Dragon - the heraldic symbol of the pope - and the Calendar providing more details on this topic). The population of Rome which had been almost halved by the direct and indirect effects of the 1527 Sack of Rome slowly recovered in the following years and greatly increased in the second half of the XVIth century: in part the increase was due to the arrival in Rome of poor people who relied on the help of charitable institutions for their living. Pope Gregory XIII realized that the Papal State needed to stock large quantities of grain to ensure a continued supply of wheat and bread at a low price: he therefore turned the remaining halls of Diocletian's Baths into granaries. He brought order to the relationships between the papacy and the formally surviving political bodies of the City of Rome. The tower of Palazzo Senatorio the symbol of communal life, was built under his pontificate. Pope Gregory XIII favoured his relatives and in particular his son Giacomo, who held several important positions in the papal administration and who acquired the fiefdom of Sora, a town near the border between the Papal State and the Kingdom of Naples: Giacomo Boncompagni became known as Duke of Sora and Palazzo di Sora, the palace bought for him by his father, was named after the town. Pope Gregory XIII is considered the second founder of Collegio Romano and he started building Archiginnasio della Sapienza which became the University of Rome. In the following centuries both institutions provided the popes with the background knowledge and skills necessary to guide the Church in theological and scientific matters. Some of the streets that were completed by his successor were initially designed during the pontificate of Pope Gregory XIII (Via Gregoriana is still named after him). In that same period St. Philip Neri, the founder of the Congregation of the Oratory, started the construction of S. Maria della Vallicella. The Counter-Reformation favoured the use of music during religious ceremonies and similar gatherings: musical selections were named oratorios after Oratorio del SS. Crocifisso, the name of the hall where they were first performed. 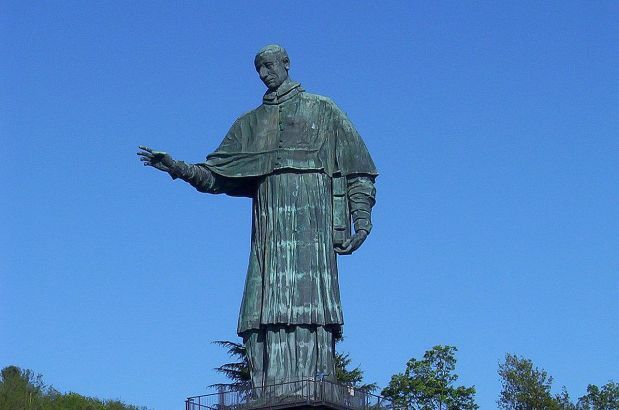 San Carlone, a colossal statue of S. Carlo Borromeo at Arona. The Borromeo family web site. 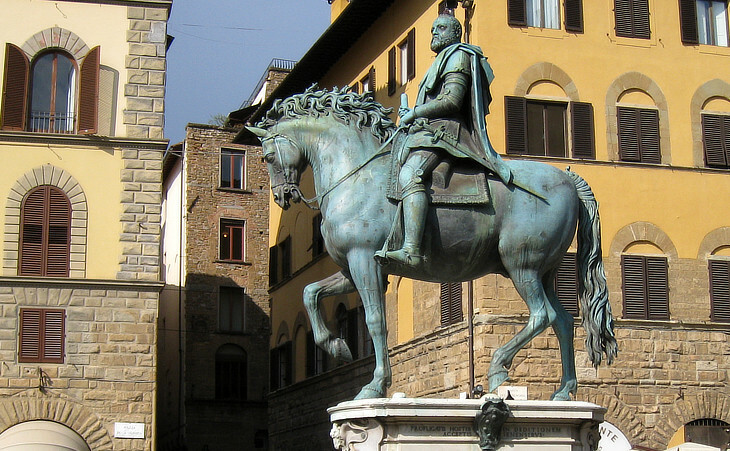 Monument to Cosimo I by Giambologna (1529-1608) - Piazza della Signoria - Florence. 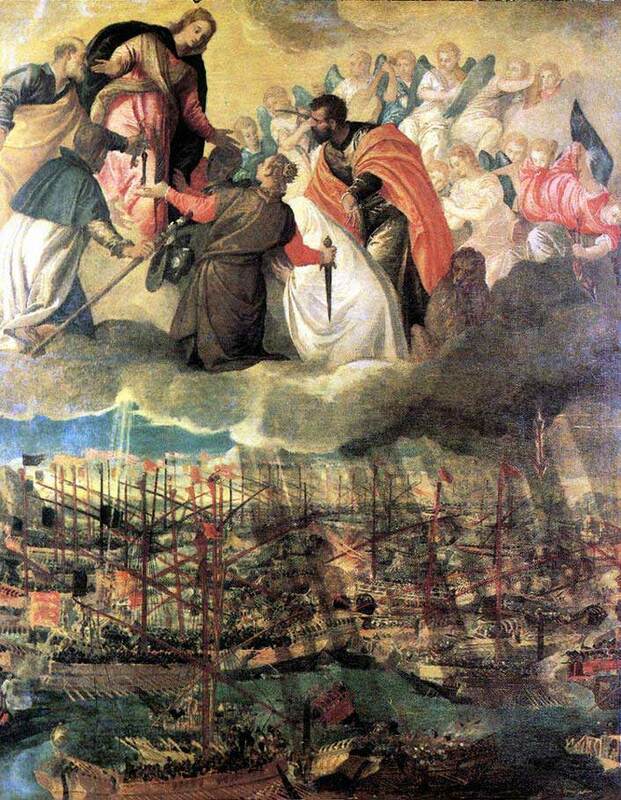 The Battle of Lepanto by Paolo Veronese (1528-88). Allegory of the Battle of Lepanto by Titian (1490-1576).